Meteorology is the study of the atmosphere. Since weather is everywhere, meteorologists can be found all over the world doing many different jobs. An operational forecaster analyzes weather conditions and issues forecasts or alerts the public of severe weather for their area. 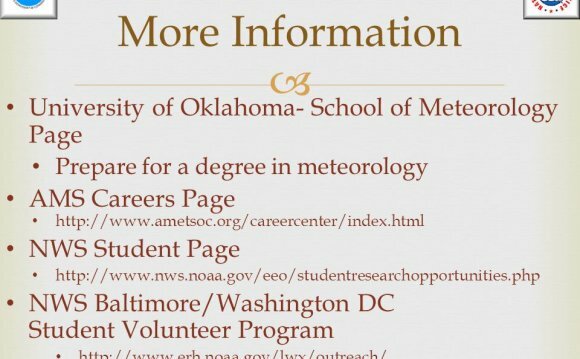 A research meteorologist studies more specific areas of weather like severe weather or climate change. They can also develop tools like radar or weather models to help other meteorologists in their jobs. A meteorologist in the military makes weather observations and forecasts for missions around the world. Airlines use meteorologists to help pilots know what the weather will be like when they take-off, land and in between. Electric companies ask meteorologists if a heat wave is coming so they have enough power ready to run lots of air conditioners. Road crews ask meteorologists how much snow might be coming so they can make sure they have enough trucks ready. Meteorologists tell fruit and vegetable farmers to turn their sprinklers on when a cold snap is coming because it can help protect crops. Meteorologists work with city managers when their town is in the path of a hurricane, if nearby rivers or streams could flood, or if a tornado is coming. What if there is a thunderstorm headed for a football stadium full of people? Meteorologists help people in charge of stadiums, arenas, shopping malls and hospitals make critical safety decisions. Radio and television stations use meteorologists, both behind the scenes and on the air, to analyze weather data and present it to their audience. And, of course we need meteorologists to teach weather in the classroom and train new meteorologists! At colleges, sometimes these teachers can do research too.